Home > Comet Clutches and Parts > Comet 216115A, 2-Pack of “Blue/Silver” Garter Springs. Comet 20/30 Series (Jr. Dragster). 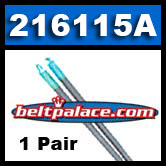 Comet 216115A, 2-Pack of “Blue/Silver” Garter Springs for Comet 20/30 Series (Jr. Dragster). Comet “Blue/Silver“ garter spring kit 216115A. Comet Driver Mod kit 216115-A: “AM KIT- (2) SPG- BLU-SIL- JR DRAGSTER”. Genuine Comet 216115A (Blue/Silver) Garter Springs for Optional Engagement of 4600 RPM with Comet Industries Aluminum Shoe Driver Kit 202931A. Made in USA by Comet Industries.